The University of Toronto and its surroundings have changed a lot since Robert Blackburn started at U of T Libraries in 1947. Classes were packed with veterans of the Second World War. On the radio, Francis Craig crooned, “There's just one place for me, near you.” And Canadian citizenship had just been created (until then, Canadians were British subjects). Blackburn took the helm of the libraries in 1954 and was the first to officially hold the title of chief librarian, retiring after 27 years. On Feb. 3, he celebrated another important milestone: his 100th birthday. 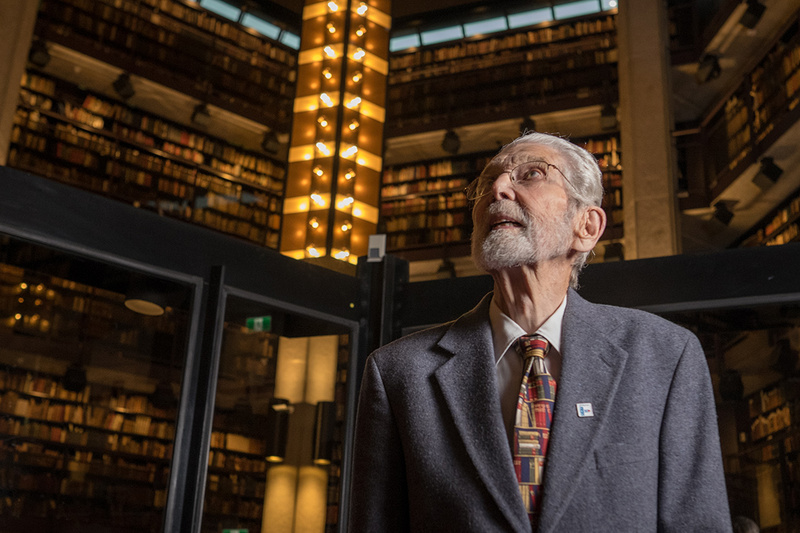 His busy tenure at U of T encompassed the building of Robarts Library and first efforts to automate the library catalogue with computers, setting the example for institutions around the globe. Over tea in Blackburn's Streetsville home, which he bought for $9,000 in 1950, he looked back on the chapters of his life. He took out a manila folder and leafed through photos of himself over the years: as a baby in his parents' arms, a wide-eyed university freshman, an Air Force navigator and a librarian. He spent his childhood on a farm in Vegreville, Alta., east of Edmonton – where his life might have taken a drastically different turn if not for a lucky harvest. In his youth, the economy was mired in the Great Depression, and his family could not have afforded to send him to university if not for a good barley crop one dry summer. They sold the crop for $490, enough to cover his first year at the University of Alberta. Blackburn had originally set his sights on a medical career, but changed his mind after a classmate took him on a tour of the anatomy lab. “In half an hour there, he killed any ambition I ever had to study medicine,” Blackburn wrote. He enrolled in honours English. At the onset of the war, Blackburn considered himself an objector, but felt compelled to enlist by the spring of 1941 after his father joined the Air Force and some of his friends were reported missing in action. He put off enlistment until after library school at U of T, “so as to have some kind of professional qualification in case I survived the war,” he wrote. He joined the Royal Canadian Air Force and attended navigation school. Of the 19 graduates in his class, 17 were posted overseas for night raids over the Ruhr. Only a few returned. “I hope there were more, but I heard of only three,” he wrote. He was held back as a navigation instructor and posted to Manitoba. After three years in the military, he applied for an honourable discharge from the RCAF, worked for the Calgary Public Library and went on for a master’s degree in library sciences at Columbia University. He was lured back to Canada by U of T librarian Stewart Wallace, a former history professor and soldier wounded at Vimy Ridge, who kept a wartime souvenir on his desk: a piece of shrapnel from his leg that served as a paperweight. When he succeeded Wallace at the helm of U of T Libraries, Blackburn inherited a library system that was bursting with books and desperate for space. To make matters worse, universities in the 1960s were bracing themselves for a surge in graduate students. Blackburn and then-U of T President Claude Bissell's advocacy were instrumental in getting a new library built, one that was meant to serve people's needs for the next 50 years. A $41-million project was approved at Hoskin Ave. and St. George St. The university hired a New York architecture firm and chose a triangular design with room for hundreds of study carrels with windows looking out on the campus below. “It's an extraordinary facility,” current Chief Librarian Larry Alford says. The building's aesthetics are the subject of never-ending debate, in the student paper and beyond. But Alford, who likes its appearance, notes it's an icon of Brutalist architecture that attracts admirers from around the globe. The carrels, meanwhile, remain prime real estate for studying. “Students use laptops instead of typewriters but they're still writing their dissertations there,” he says. Under Blackburn's watch, the central library amassed a collection that was the envy of institutions across the continent. In the 1960s, the library acquired up to a quarter million books per year, “more than any other university on the continent and maybe the world,” he said. Many of those materials are among the library's greatest treasures, including Shakespeare's Four Folios gifted by the Fisher family. The First Folio, published in 1623, was the first collected edition of Shakespeare's plays and only 232 copies still exist. Another of Blackburn's signature achievements, and possibly the most important, is taken for granted by most people who use the library today, Alford says. In the early 1960s, libraries usually had card catalogues with entries for individual titles, each typed and filed by hand. Blackburn supported the efforts of Ritvars Bregzis, associate librarian, and Calvin Gotlieb, director of the Institute of Computer Science, to use computers to automate the library's catalogue. It was impossible to foresee where the technology would lead, Blackburn recalls. “I had no idea where it was going, except to speed up our services and paperwork, and maybe save some money,” he says. The library acquired its own computer, a clunky Sigma 7 that required its own air conditioning. In the late 1970s, the library succeeded in freezing its card catalogue and introduced the forerunner of today's electronic catalogue. “Toronto was the first large library anywhere to have its whole catalogue in machine-readable form,” Blackburn recalls in his memoir. Blackburn retired in 1981, freeing up time for other things. He's spent time with family and friends, travelled, gained acclaim for the home garden he tends to with his second wife Verna, and has written nine books, including a history of U of T Libraries. He also survived major health scares – a heart attack and broken hip. He attributes his longevity partly to his upbringing on the farm, where he grew up on fresh food and worked up a hearty appetite. He's never smoked and, for the last 35 years, has exercised almost every day before breakfast. He does sit-ups, stand-ups and touches his toes. Ironically, although he spent his life surrounded by books, Blackburn rarely had time to take them home. Alford, who became chief librarian in 2011, sympathizes. The libraries have become a large IT operation, managing a petabyte of data. They select, acquire and preserve a vast collection. And they welcome tens of thousands of visitors per day, about 18,000 at Robarts alone. Blackburn says much has changed at the library since his time, except, of course, “the intensity of study” all around. Speaking before his birthday, he said he would think about the library when he blows out the candles on his cake.